I’m excited to announce my new listing! 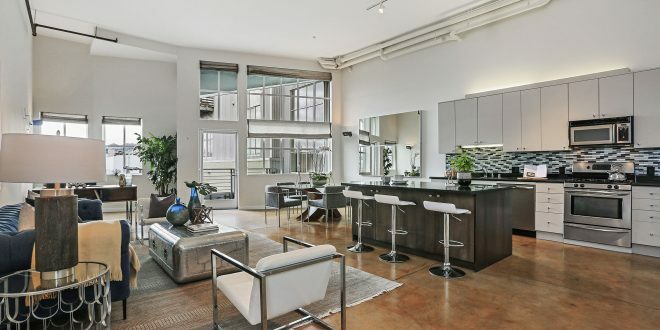 It is a beautiful 2 bedroom converted loft in SOMA at 60 Rausch, #308. It is located in mid-Market; this area has really been changing since Twitter brought its offices to 1355 Market Street at 9th. It’s a perfect place for someone working downtown or on the peninsula who wants a spacious retreat to come to at the end of a busy day. The loft is amazingly quiet considering it is in such a vibrant area. This building was tastefully converted into 37 live/work lofts in 2002 by Hauser Architects. It is located on Rausch, a tree-lined street, between Folsom and Howard and 7th and 8th Streets. The modern kitchen with stainless steel appliances has a versatile granite-top Island. The kitchen opens into an expansive living/dining area with soaring ceilings that extends onto a private deck that enjoys beautiful views toward Sutro Tower. A bedroom suite and laundry room with in-unit washer/dryer plus extra storage are on the first level, and a nicely designed master suite with walk-in closet (upgraded with custom California Closet organizers) is above. One car parking is included. Tech shuttles are nearby. There is easy access to downtown, CalTrain and Highways 80, 101 and 280. The list price is $1,295,000. Feel free to contact me to arrange an appointment to see this special home! Previous: Turning Lemons Into Lemonade! Next: Is the Bay Area Real Estate Market Tanking?